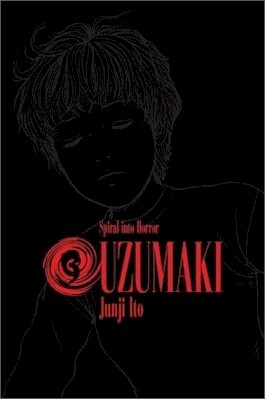 Uzumaki 3 cover image is courtesy of Anime Castle Books. The Japanese coastal village of Kurôzu-cho is beset, haunted, and cursed by that particular pattern called the spiral (uzumaki). The spiral manifests itself everywhere – on seashells, in the clouds above, and even in the whirlwinds (or dust devils) that plague the village streets. Soon after the arrival of the spiral, many of the citizens of Kurôzu-cho begin to die violent and often shockingly bizarre deaths, with heroine Kirie Goshima witnessing it all. In Uzumaki, Vol. 3, the citizens of Kurôzu-cho are cut off from the outside world as titanic typhoons (hurricanes) and whirlpools keep the Japanese Navy from reaching the village. Reporters and rescue teams that arrive by land find themselves trapped in the valley, including the beautiful female reporter for Toyo television, Chie Maruyama. The desperate townsfolk and newcomers struggle to survive, while some of them are slowly transformed into giant snails and therefore, become a source of meat for the starving citizens. As the pattern of the spiral completely takes over the town and the very laws of nature change, Kirie and her boyfriend, Shuichi Saito, embark on a final quest. THE LOWDOWN: One of the things that makes Uzumaki so unsettling and scary is the fact that the people of Kurôzu-cho are victims of malevolent, supernatural circumstances. Some unseen force begins punishing many of them for crimes against their fellow man and against the natural order, which is suddenly, actually unnatural. This is a reflection of Uzumaki creator Junji Ito’s love for the work of H.P. Lovecraft, which depicts characters facing great, unknown, malevolent forces. With his beautiful art – composed of a delicate line and detailed line work, Ito chronicles his bizarre conceptions in a narrative that has the most disturbing atmosphere. The horrors that Ito visits upon his characters are so convincing and realistic, while being clearly unnatural. Uzumaki’s concept: a pattern – the spiral – taking over a town, seems funny when first hearing of it; it just seems like lunacy. Then, the reader enters a fictional world that is quite disturbing, and eventually realizes that Uzumaki is the face of horror. POSSIBLE AUDIENCE: Readers looking for that next landmark in horror comics and also readers who take recommendations from Warren Ellis to heart will want Uzumaki.